Joe MacDonald was Ian Brown’s father’s cousin. 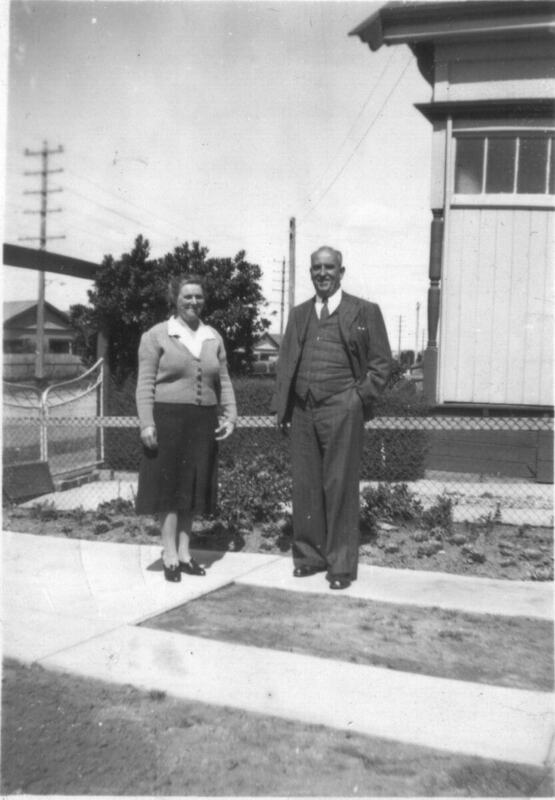 Ian has sent both information about and photos of Mr MacDonald who worked for Asiatic Petroleum in China and in all probability Hong Kong during the late 1930s. He appears to have travelled quite a bit during his time in the former and may well have lived and worked in Shanghai. 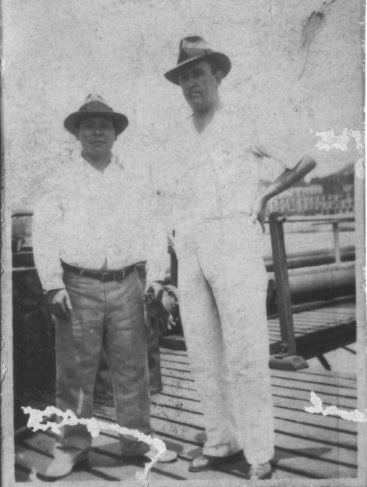 This undated photo shows Joe on the right and a colleague at a work site, location and date unknown. Joe MacDonald was born in Renfrew, Scotland on 16th December 1893. Joe MacDonald and his wife Elizabeth, known as Lizzie, (née Smith) married at Inchinnan, Scotland, on 29th September 1937 when Joe was 43, occupation given as marine engineer. The couple sailed on the Corfu for Hong Kong in November of that year. The fact that Adam Holland, married to Joe’s sister Jessie, was in Hong Kong may have inspired and facilitated his move to China. Joe had served an apprenticeship as an engineer in a Clydeside shipyard and had operated a confectionery shop at 6 New Street, Paisley, Scotland, in the early 1920’s. This photo shows the MacDonalds outside a residence. Unknown location and date. 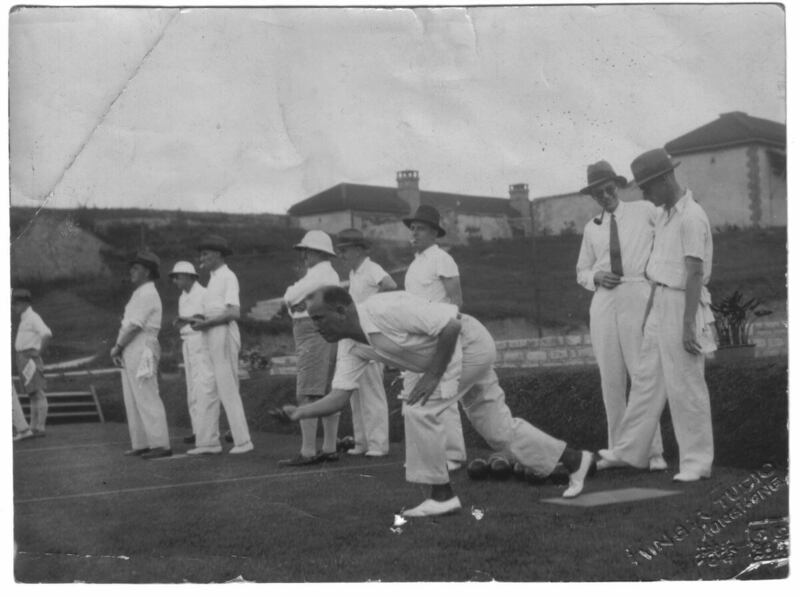 And this shows Joe MacDonald as the tall, heavily built, balding gentleman at a bowling club. Again unknown location and date though the photo appears to have been printed in Hong Kong (see bottom right hand corner). Lizzie MacDonald wrote this letter to Ian Brown’s grandmother Mary Brown. 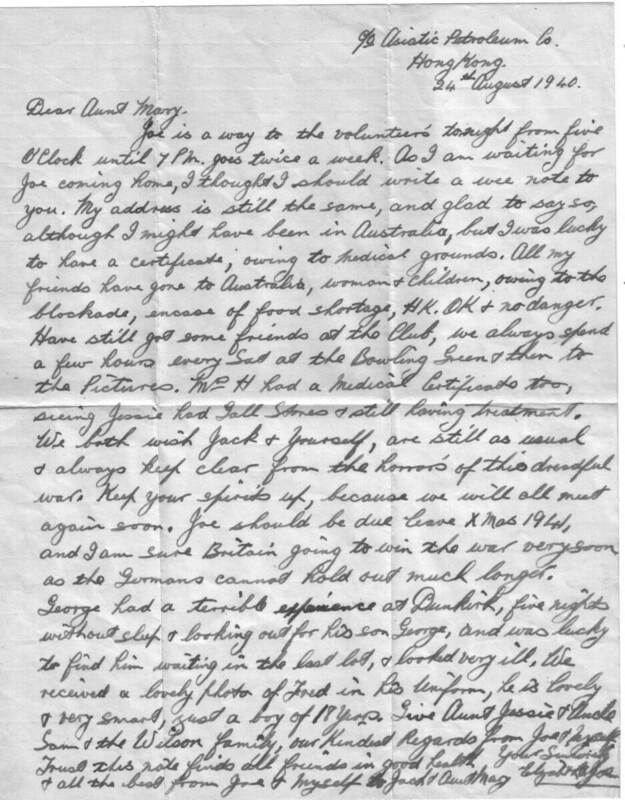 It notes that Joe was due leave at Christmas 1941. The Japanese occupied Hong Kong in December of that year and the Governor of Hong Kong, Sir Mark Young surrended on the 25th. However, both Joe and Lizzie returned to the UK prior to hostilities and did not return. Joe died in the UK shortly after the war following complications after surgery for stomach ulcers.